The ACCESS Master MT9081 Series are compact and affordable handheld battery-operated OTDRs designed for last-mile FTTx metro access network testing as well as most short- and long-haul fiber test and maintenance applications. ACCESS Master is a major improvement for metro area operation over existing OTDRs in terms of overall performance and ease of use, with optical power measurement capability and a light source as standard features. Its uniquely short 1m dead zone provides essential accuracy for analyzing problems in short fiber runs and typical FTTx applications. Its large 38.5 dB dynamic range makes it usable on fiber lengths up to 150 km (94 miles), easily meeting most OTDR requirements. ACCESS Master has special features for professionals responsible for installing and maintaining fiber links to the premises (FTTP), home (FTTH), or curb (FTTC). A user-friendly keypad plus easy one-button measurements provide metro-area analysis and accuracy combined with service provider simplicity. 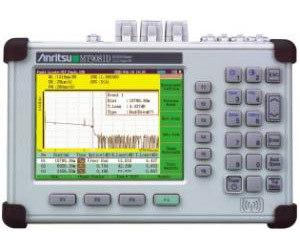 A unique Ethernet/IP option allows users to test IP performance and connectivity accurately without the inconvenience and performance problems associated with using a standalone PC. Lightweight at just 2.2 kg -- light and compact for easy use in the field.